This is a very fast flower to make when you need a last minute flower for your daughters hair, a gift, pin or just whatever....it's very easy and very fast. 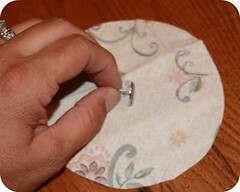 Cut your fabric in 3 different sized circles. Use fray check on edges to seal so your fabric will not fray. Or if you like fraying, just leave it as is. That is what I did with this one. I like a little fray.My largest Circle in 4" round and I just cut the others to the size of my liking. Make sense? Hope so. LOL! Now stack all of them together, largest to smallest. Turn over. Get your "BRAD" and place in the center of the upside down fabric circles. Carefully turn back over keeping all the circles in line and brad in center of the back. Carefully pull back your fabric around the brad and secure with 3 plastic rubber bands. You can find these in the hair section of just about any store. I have also found them in great container, good for storage, in the infant toddler sections. 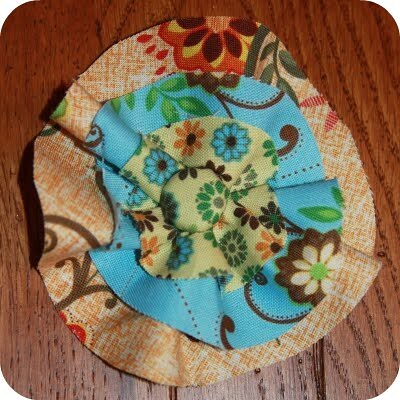 Next, you want to gently pull back your fabric in the shape of a flower. 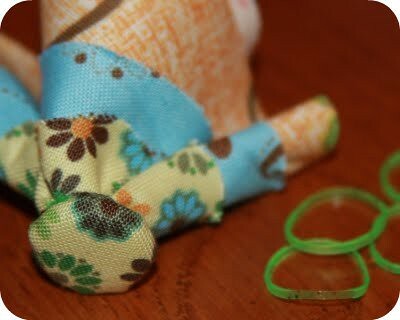 The rubber bands will help in shaping your flower by ruffling the fabric a bit. Just be careful not to tug too hard because the rubber bands will pop right off. LOL And sometimes smack you in the face. Hee! Trust me I know! 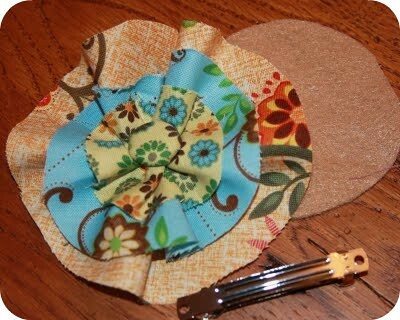 Then all you need to finish this is a small round piece of felt (this helps hold your flower in place and gives it a nice finished look) for the back and your choice of clip, barrette or pin to finish it off. Depending on how you want to use it. You may even want to make a bunch to decorate a purse or wall hanging. Be creative. Very Cute!! They do look pretty easy to make. So Quick when you need a flower...cute idea! What a great idea and looks simple enough for kids to make! I'll have to try this! Love the fabric you chose. Adorable and easy too! Thanks for the tut these are adorable! Thank you everyone! I got the fabric from a quilt kit at JoAnn's. 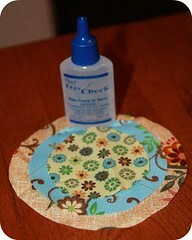 Cute and easy peasy...my kind of craft! 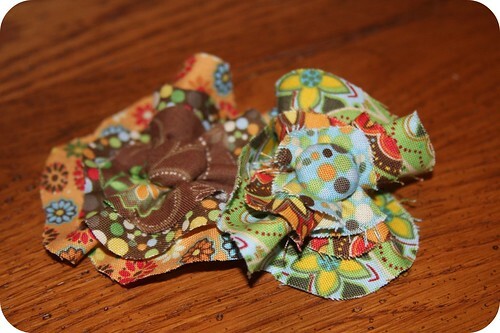 So cute and I love your fabric! These are so cute & simple! I'll have to make some & I know my 10 yr old girl will love them! Thanks for sharing! I'll come back & share my link after I've made them! That's super cute! Can I ask, what kind of "brad" did you use? very cute! I'm loving making fabric flowers also! 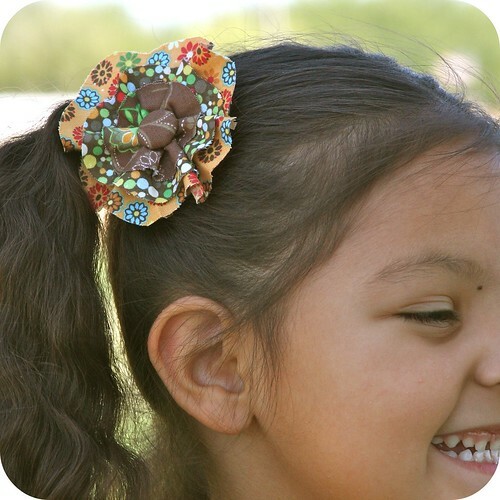 What a darling hair accessory! I LOVE it and super easy!!! Thanks for sharing.